Last year, William Larue Weller was the runaway star of Buffalo Trace’s Antique Collection. This year’s release is at cask strength, 12 years old, and comes from the second and sixth floors of Warehouses I, K, and L at Buffalo Trace. 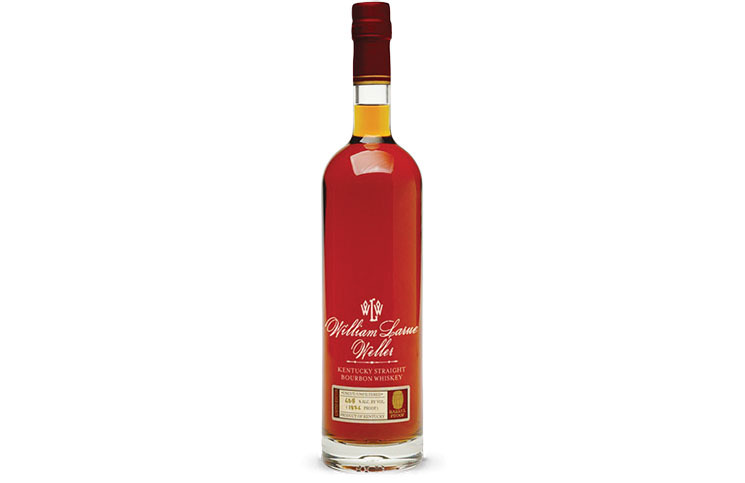 William Larue Weller Kentucky Straight Bourbon Whiskey (67.3% ABV, $80) – the nose for this cask strength whiskey is nothing short of explosive. Oak leaps out of the glass, and is combined with clove, orange peel, cinnamon, caramel, and apricot. The oak on the nose is a combination of digested varnished oak and dusty cedar plank. As expressive as the nose is, there’s also a solid integration of these aromas. They all fit together and make sense. The entry is the kind of explosive fireworks that the great monster whiskeys are known for (like the old George T. Stagg). Cinnamon spice erupts on the entry, balanced by caramel and apricot. The mouthfeel on this whiskey hits the mark and its rich fullness balances out the cinnamon spice. In the midpalate there’s a crescendo of the cinnamon spice which combines perfectly with the wood from the nose. There isn’t as much complexity of flavor in this year’s William Larue Weller compared to last year’s, but the pieces fit together in the midpalate very well with strong balance. A very long and flavorful finish, focused around spicy hot cinnamon with a touch of anise, rounds out a really impressive taste experience. As with last year, this year’s William Larue Weller release is the absolute star of the Buffalo Trace Antique Collection. It’s everything that fans of big, bold, cask strength whiskeys are looking for. While it may be slightly less complex than last year’s release, it still has more than enough to impress. 93 Points. As with last year, this years William Laure Weller release is the absolute star of the Buffalo Trace Antique Collection. It's everything that fans of big, bold, cask strength, whiskies are looking for. While it may be slightly less complex than last year's release, it still has more than enough to impress.